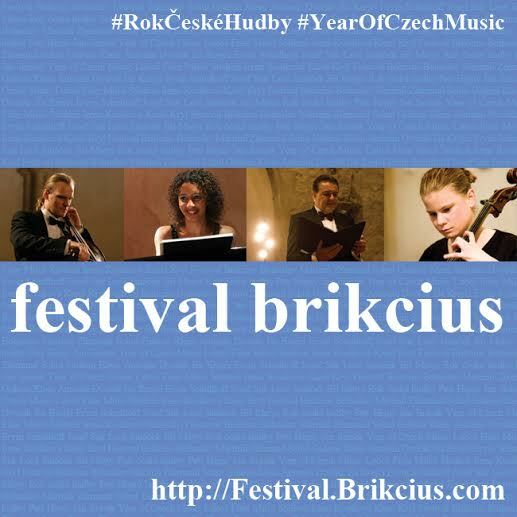 You are invited to the “FESTIVAL BRIKCIUS” – the 3rd chamber music concert series at the Stone Bell House & “Year of Czech Music 2014″, organized in partnership with the City Gallery Prague this autumn, in the exclusive location of the Stone Bell House in Prague’s Old Town square. The Festival Brikcius commemorates the 55th anniversary of the death of Bohuslav Martinu, the 70th anniversary of the death of Zikmund Schul, the 95th anniversary of the birth of Gideon Klein, the 110th anniversary of the death of Antonin Dvorak, the 110th anniversary of the birth of Isa Krejci, the 120th anniversary of the birth of Erwin Schulhoff, the 140th anniversary of the birth of Josef Suk and the 160th anniversary of the birth of Leos Janacek. The Festival Brikcius is taking place under the auspices of the Mayor of City of Prague, Tomas Hudecek, under the auspices of the Mayor of Prague 1, Oldrich Lomecky, and in cooperation with the Prague 1. The artistic patrons of the Year of Czech Music 2014 are the mezzo soprano Magdalena Kozena and the chief conductor Sir Simon Rattle. The Festival Brikcius forms part of the Daniel Pearl World Music Days. The 3rd annual festival will feature Czech cellist Frantisek Brikcius, French pianist Justine Verdier, Czech cellist Anna Brikciusova and siblings cello chamber ensemble Duo Brikcius. The dramaturgy of this “Year of Czech Music 2014″ is focused on anniversaries of Czech composers (B. Martinů, A. Dvorak, I. Krejci, J. Suk, L. Janacek); “Terezin”/Jewish authors (E. Schulhoff, G. Klein, Z. Schul); and contemporary music works (J. Matys, P. Hejny, J. Jirasek, L Fiser, M. Stedron, I. Kosikova). 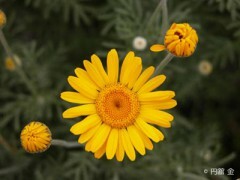 For further information, visit http://Festival.Brikcius.com . 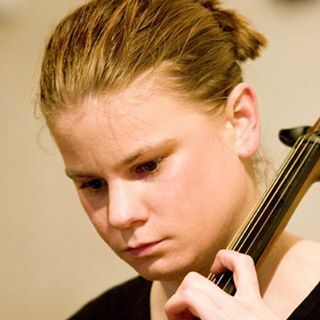 - The opening November concert PRAGUE – BRNO: 6 CONTEMPORARY COMPOSITIONS FOR SOLO CELLO will take place on Thursday 6th November 2014 at 7.30pm. 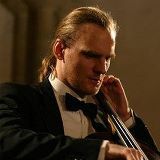 Czech cellist Frantisek Brikcius will present cello works by leading composers from Prague and Brno (Lubos Fiser, Petr Hejny, Jan Jirasek, Irena Kosikova, Jiri Matys and Milos Stedron). You will hear Fantasie and Rondo (1982) by composer Jiri Matys, Metall Sonata (1983) by cellist, artist and composer Petr Hejny, Dilema (1987) by film composer Jan Jirasek, Sonata (1987) by music and film composer Lubos Fiser, Dances of King Lear (1995) by a composer from Brno, Milos Stedron, and Stopy (2004) by Czech composer and organist Irena Kosikova. A live recording of the concert held under the auspices of Vaclav Havel was released on CD and introduced by following concert tour “Brikcius Cello Tour” in the Czech Republic, Austria, Belgium, Bulgaria, France, Italy, Russia and the United Kingdom. As a special encore you will hear Bassnachtigall (1922) by Jewish composer and pianist Erwin Schulhoff (1894 – 1942). - The November concert DUO BRIKCIUS & YEAR OF CZECH MUSIC (2 Cellists – 2 Siblings) will take place on Thursday 20th November 2014 at 7.30pm. The two cellists, brother and sister Anna Brikciusova and Frantisek Brikcius (Duo Brikcius), will introduce a new programme for two cellos. It includes: Suite for Two Cellos by composer and cellist from Prague David Popper (1843 – 1913); Chassidic Dances by “Terezin” Jewish composer Zikmund Schul (1916 – 1944); Composition for Two Cellos by Czech composer Bohuslav Martinu (1890 – 1959; Duo by “Terezin” Jewish composer Gideon Klein (1919 – 1945), written shortly before World War II. 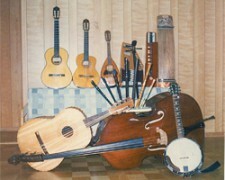 The Duo and other pieces by Gideon Klein were promoted and revised by composer Vojtech Saudek (1951 – 2003), grandnephew of Franz Kafka; and Arrangement of the Presto by Czech composer Leos Janacek (1854 – 1928). As a special encore Duo Brikcius will play the composition Bridges for two cellos by Czech composer and organist Irena Kosikova who lives in France. The music is dedicated to Swiss bridge builder Toni Ruttimann. - The final Christmas concert CELLO AND PIANO & FIVE JUBILEES will take place on Thursday 18th December 2014 at 7.30pm. French pianist Justine Verdier and Czech cellist Frantisek Brikcius will play compositions of five authors for cello and piano, who’s important anniversaries we remind this year. They are Pohadka for cello and piano by Leos Jancek (1854 – 1928), Balada and Serenada for cello and piano op. 3 by Josef Suk (1874 – 1935), Sonatina concertante for cello and piano by Isa Krejčí (1904 – 1968), Klid op. 68 for cello and piano by Antonin Dvorak (1841 – 1904) and Variations sur un theme slovaque, H. 378 by Bohuslav Martinu (1890 – 1959). As a special encore they will perform Presto by Leos Janacek (1854 – 1928). Tickets for the concerts at the Stone Bell House can be obtained either from Prague Ticket Office – Via Musica, Ticketon.cz or at the door from about 90 minutes before every concert. Prices: 400 CZK (advance ticket sales 380 CZK) / senior discount, student discount: 200 CZK (advance ticket sales 180 CZK). Given the limited number of seats we strongly recommend early booking! 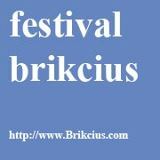 We encourage you to support “Festival Brikcius” and buy a patron’s ticket. - As part of the festival’s accompanying programme there will take place in France, on Thursday 16th October 2014 at 7.30pm, the gala opening of the Czech-French cooperation in the occasion of the CZECH-FRENCH MUSIC ENCOUNTER, hosting Czech organist and composer Irena Kosikova, Duo Brikcius (2 Cellists – 2 Siblings) and guests from France. By invitation only. - Another accompanying activity will be the poetry reading BRIKCIUSOVA NA PRADLE – OPILA PLACHTIVICE from Anna Brikciusova’s new poetry collection, read by Jan Zidlicky with accompanying music by the author, scheduled for Sunday 16th November 2014 at 6pm, at the Church of St. Jan Krtitel Na Pradle (Ricni 6, Praha 1), as part of the 16th Festival Poetry Day and the 204th anniversary of the birth of poet Karel Hynek Macha. Free entry. The main purpose of the annual Poetry Day Festival, held on the anniversary of Macha’s birth (16th November 1810), is to raise awareness of poetry. The event will also premiere a new composition by organist and composer Irena Kosikova. - Festival Brikcius is a media partner of film music document MAKANNA from the concert performance of a ballet written by composer Irena Kosikova for voice (Jan Zidlicky) solo cello (Frantisek Brikcius) and orchestra (Jan Talich – conductor, Talich Chamber Orchestra), premiered at the Convent of St Agnes of Bohemia under the auspices of Sir Tom Stoppard and Vaclav Havel. The film celebrates the 55th anniversary of the death of the Czech writer Jiri Weil (1900 – 1959). The premiere will launch on Thursday 27th November 2014 at 7.30pm on YouTube ( http://www.YouTube.com/FrantisekBrikcius ). 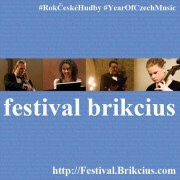 More information is available in the monthly CZECH CELLIST FRANTISEK BRIKCIUS NEWSLETTER, on social networks (FaceBook, YouTube, Twitter) and on http://Festival.Brikcius.com . What anniversary of the birth of Josef Suk commemorates the Festival Brikcius – the 3rd chamber music concert series at the Stone Bell House? 1. 100th anniversary of the birth of Josef Suk. 2. 120th anniversary of the birth of Josef Suk. 3. 140th anniversary of the birth of Josef Suk. Email your answer to Win@Brikcius.com by 30th September 2014. The Year of Czech Music 2014 is a remarkable year for Czech music, with over sixty prominent Czech composers, performers and musical organizations celebrating anniversaries – from Antonun Dvorak, Bedrich Smetana, Leos Janacek, Bohuslav Martinu and Josef Suk to Rafael Kubelík to the Prague Symphony Orchestra. As the attentive public may be aware, years ending in the numeral 4 are recognized as “years of music”. The tradition is very long and started in the year 1924 with celebration of Smetana’s anniversary. Artistic patrons of the Year of Czech Music 2014 are mezzo soprano Magdalena Kozena and chief conductor of Berliner Philharmoniker Sir Simon Rattle. Honorary president is Jiri Belohlavek, the chief conductor of the Czech Philharmonic. 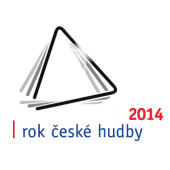 More details about the Year of Czech Music 2014 are available on websites http://www.YearOfCzechMusic.cz . Czech composer and violinist Josef Suk was born on 4th January 1874 in Krecovice, into the cantor family of Emilia Sukova-Baumanova and Josef Suk. He was the youngest of three children (brother Antonin *1856, sister Emilie *1869). In 1885 – 1892 Suk studied at the Prague Conservatory, violin with Antonin Bennewitz (1833 – 1926), composition with Karel Stecker (1861–1918) and later in the master class with Antonin Dvorak (1841 – 1904). In 1892, together with his fellow student colleagues from the conservatory, violinist Karel Hoffmann (1872 – 1936), composer, conductor and violist Oskar Nedbal (1874 – 1930) and cellist Otto Berger (1873 – 1897), he founded the Bohemian Quartet, with whom he performed around the world till 1933. Since 1922 he was a professor of the master class of composition at the Prague Conservatory, later he was repeatedly a rector of the conservatory. Among his students were Jaroslav Jezek (1906 – 1942), Klement Slavicky (1910 – 1999), Pavel Borkovec (1894 – 1972) and for one year (before his departure to France) Bohuslav Martinu (1890 – 1959). 1898 he married Dvorák’s daughter Otylia (1878 – 1905). In 1901 was born their son Josef (1901 – 1951). In May 1904 suddenly died Antonin Dvorak, in July 1905 died Suk’s wife and Dvorak’s daughter Otylka. Suk never get married again. He won the silver medal at the Art competitions at the Summer Olympic Games 1932 in Los Angeles with his work Into a New Life. In 1935 he received an honorary doctorate from Masaryk University in Brno. Josef Suk died on 29th May 1935 in Benesov and he is buried in Křečovice, where you can visit the Josef Suk Memorial. 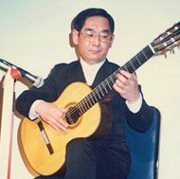 His grandsons are violinist and violist Josef Suk (1929 – 2011) and poet and writer Jan Suk (* 1951). The Festival Brikcius – the 3rd chamber music concert series at the Stone Bell House & the Year of Czech Music 2014 commemorates the 140th anniversary of the birth of Josef Suk on the final concert featuring his Balada a Serenada, Op. 3 (1890/96), performed by French pianist Justine Justine Verdier and cellist Frantisek Brikcius. For more details about Czech composer and violinist Josef Suk visit http://www.Brikcius.com , http://www.SukSociety.cz and http://en.wikipedia.org/wiki/Josef_Suk_(composer) . Advance tickets sales for the Festival Brikcius – the 3rd chamber music concert series at the Stone Bell House in Prague & Year of Czech Music 2014 are open now. Tickets can be obtained either from Prague Ticket Office – Via Musica and Ticketon.cz . Given the limited number of seats we strongly recommend early booking! More details are available on official festival websites http://Festival.Brikcius.com .